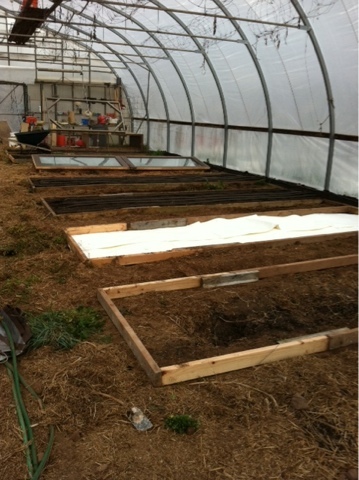 Back to the room at the end of the hoophouse..plastic, clear roof installed a few weeks ago, working beautifully. The base of the platform needed protection, since wood rots when wet. 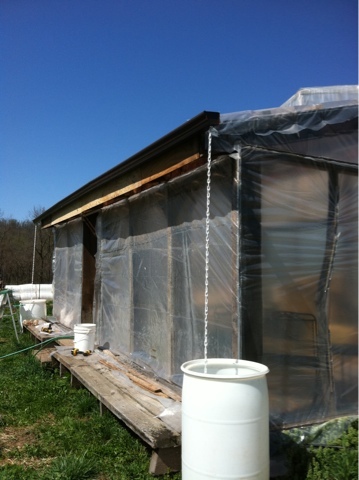 Up go rain gutters, rain barrels, and in place of down spouts..chains..to guide water into the barrels. Always trying to save a little bit everywhere we can! 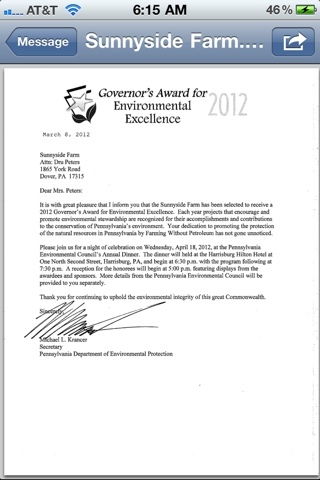 yup, we received official notice. so excited! now to figure out what to "display"..a chicken pen perhaps? The cattle look hot these days. The sudden and extended jump in temperatures has them dropping hair like crazy! The winter coats they each produced just a few months ago are way too warm this spring. One pat with the gloved hand produces an immediate hairball. 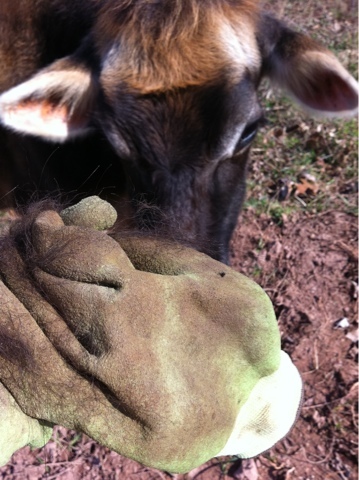 They are busy rubbing on everything they can find, working out clumps of hot fur. And the song birds filling the fields and woods today are using these castoffs to line their nests. Some days and certainly most nights in March we are using the furnace to heat the house. It seems like it has barely run this year..a welcome change! 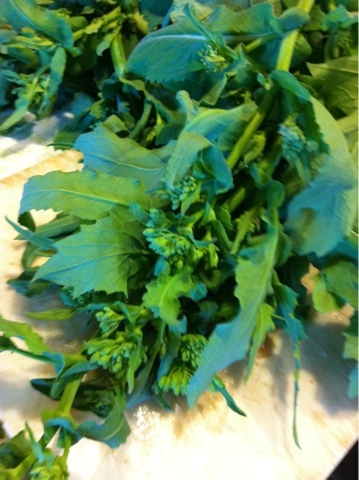 We usually can eat greens: kale, collards, cabbage, mustard until well into April. This year it is bolting faster than we can eat it..so I am eating it just before the flowers bloom! The pigs are happily eating the plants that got away from us. 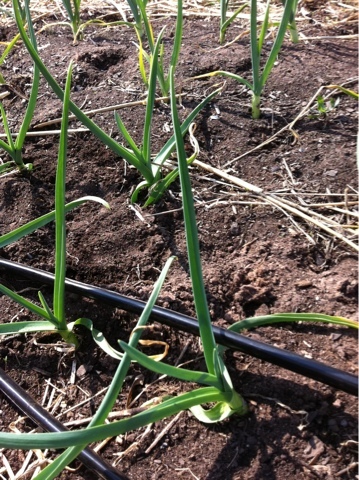 Today's edition of what the farmer eats: cook garlic and onions until tender and sweet. 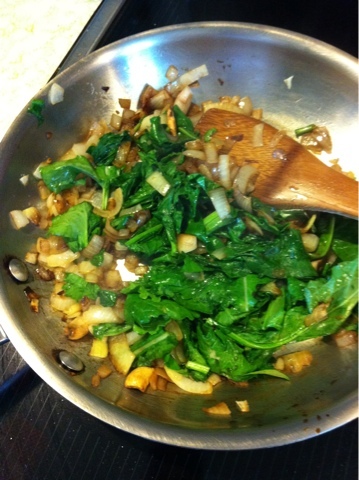 Sort greens, rinse under water and while wet chop across the broad leaves so the portions are in strips. Add to pan with garlic and onions..put a little water in, salt and pepper, and as they wilt a splash of vinegar..your favorite flavor..eat it hot. 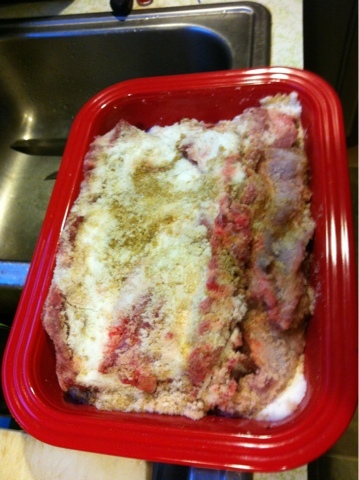 Combined with eggs your favorite way..just pulled from under the hens..and it is a meal fit for royalty. If having weeded, hauled stuff, moved stuff, planted and watered stuff, chopped stuff..feel free to take an early afternoon nap. Then back out for more egg collection, weeding, watering, moving of stuff..
Before we moved here this property was a bird farm of an entirely different kind..where the business was to breed and sell exotic birds. And all they needed..cages, feed, toys. 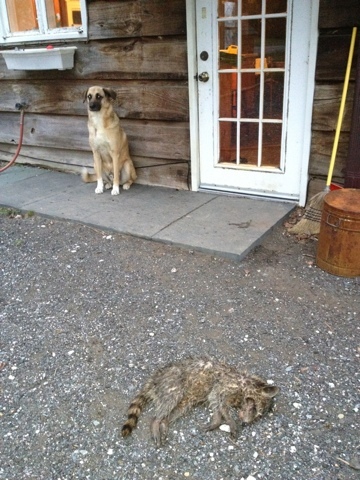 There are things left all through the woods on our property. As often as possible we reuse what is in there for our own purposes. Three stands, 9 holes each, probably held 5 gallon buckets filled with bird gear..different seed mixes or some such thing. 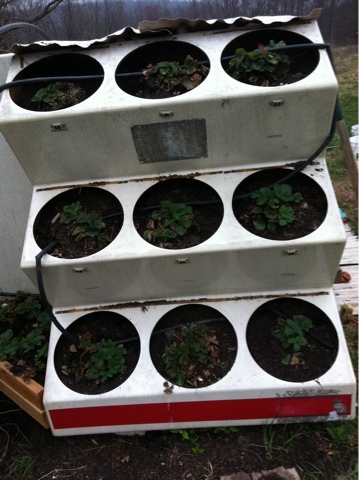 Now, filled with growing medium, the strawberries have gone in. 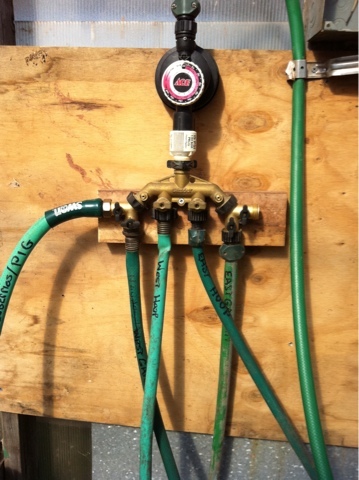 With a drip tape system stretched across it is easy to water. And the plants, so far, sure seem to love it. 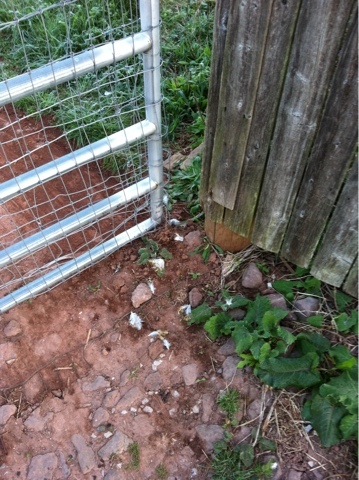 Now we see if we get any strawberries. Last May our milk cow gave birth. Out on the field, by herself..the dairy she was born and raised on breeds cows who birth unassisted outdoors. When we realized she was laboring the instructions were "do nothing". We were happy to oblige and watched from a distance. Today, her calf no longer seems like a calf. 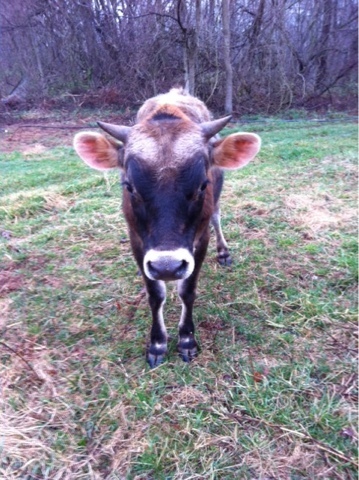 Not quite a year old, he is curious, has a lovely set of horns and does not appear to know his own strength. Skittish for a long time, he has become bolder in the last month or so and will get close to us. Uncomfortably close really. Not a baby at all anymore, never turn your back when in the paddock with him..as he tests the boundaries of his own strength..caution is exercised daily..
Lots to do these days. Somedays up before the sun and then have to wait for it..Sandi, not so tickled with that, tries to catch up on sleep while trying to warm up too..
2 weeks ago we were beginning to think eggs were going to have to be purchased off farm. 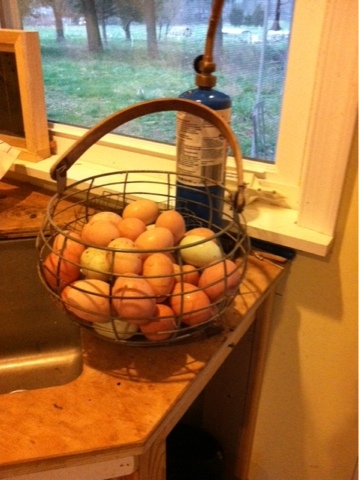 Then..3 eggs a day, then 6, then 12..now a basket full, and next week we hope for multiple baskets full. Spring! Water and where it goes is always a challenge. Homer got fancy yesterday with manifolds and timers..combined with alarms on the iPhones all 80 beds will get nice deep drinks. The plumbing torch? Used in preparing creme brûlée. Flint striker too. 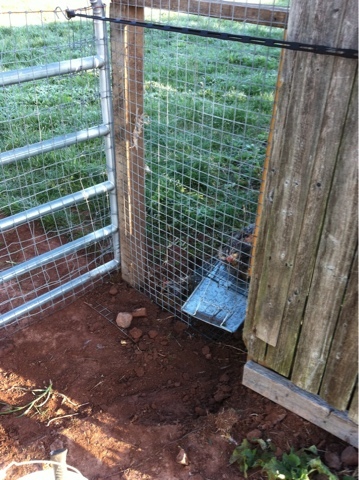 We have been using the electric fence netting to keep the laying hens in place. They do a thorough scratching up/dethatching on the grass..Homer and I are so hoping that this going over eliminates poison ivy..we can dream, right?! This picture shows the difference between where they were and they are now. 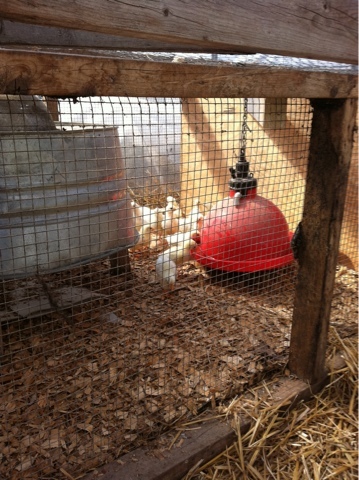 We are getting eggs now, almost a dozen each day. 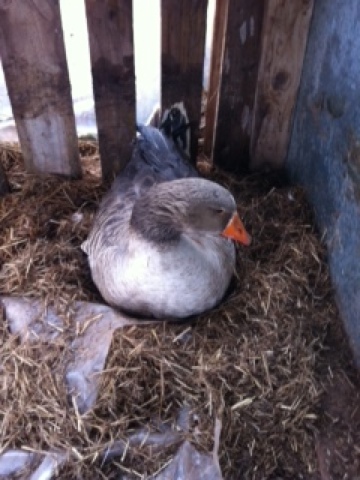 The numbers are steady climbing and we expect to have excess eggs in the next few weeks. The egg CSA starts just as soon as we have enough to deliver! 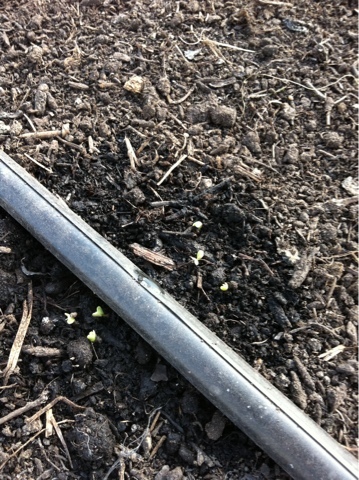 It is happening, sprouts are beginning to look like things we will eat.. Seeds usually sprout with a pair of round leaves. Then arrives a set of true leaves. When the second set of true leaves arrives it is time to introduce the seedling, or start, to the outdoors. 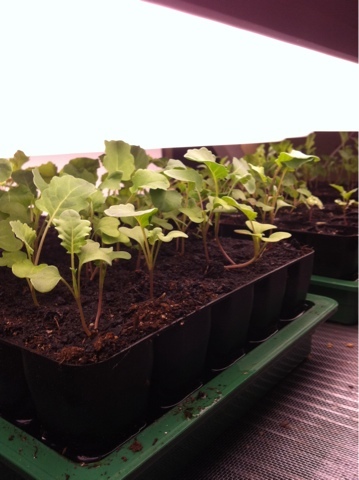 We start with daytime hours and then protected nighttime until the plant is really ready to face the outdoors. Then into the real ground it goes! Those are cabbage, broccoli and cauliflower. Yesterday, after picking up a pig from the butcher, I heard a news report on the radio. The headline was how eating red meat causes a higher rate of cancer. And here I was with 40+ pounds of pork, wrapped in brown paper and under bags of ice in the bed of my truck. The scientist who conducted the study was interviewed. 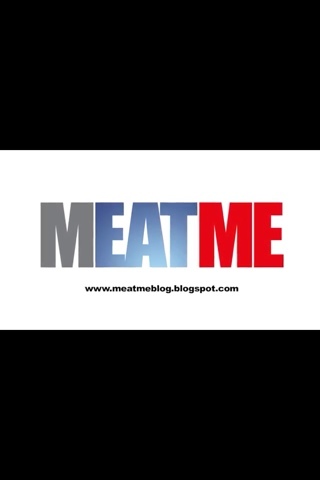 He mentioned that the people who end up with cancers are eating the meat that..we rarely eat. Our pork comes from the butcher nitrate free..and the research has shown for years that nitrates are a carcinogen, so we skip that..and our beef is grass fed..so we skip a bunch of other stuff he mentioned. 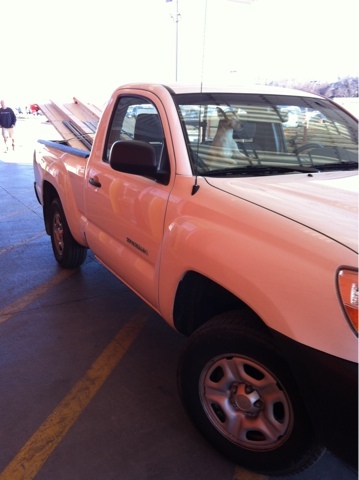 And more specifically I had 2 whole pigs in the bed of my truck. We had eyed them up for experimenting with charcuterie..and it was time to reduce the number of pigs on the property. So our experiments in salting, sugaring, brining, flavoring, wrapping, hanging..will take place with these smaller pieces. That way if it is a total fail we will not break the bank. But if it is good?! Real bacon, salami, prosciutto?! Nitrate free, slowly converted by salt and a little bit of sugar, spices, herbs and hang time into..delicious goodies?! And just like that, the roof on the room at the end of the hoophouse is completed. Clear plastic was used..if it gets too hot there are plenty of things (shade cloth, drop cloth that can be added inside to cool things down. And yes, the dog has her eye on Homer at all times, even when she is behind the wheel ;)! There are seedlings everywhere. 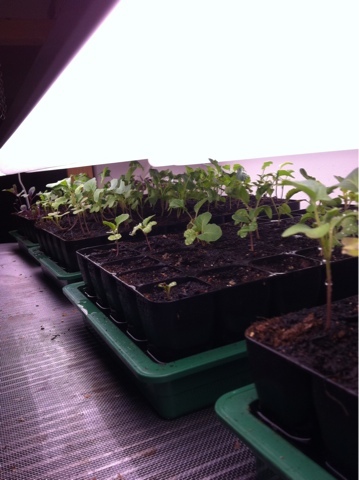 We started seeds in 3 different places: under lights with heat pads under, in a cold frame in the hoophouse, and in the hoophouse with no cover. Our conclusion? Just add water and seeds grow..anywhere! The ones with lights and heat are a little bit ahead of the others, but all are sprouting, growing, reaching for the sun. Another week and more seeds get started. If we are going to have vegetables to eat half of the year we have to plant 3/4's of the year. 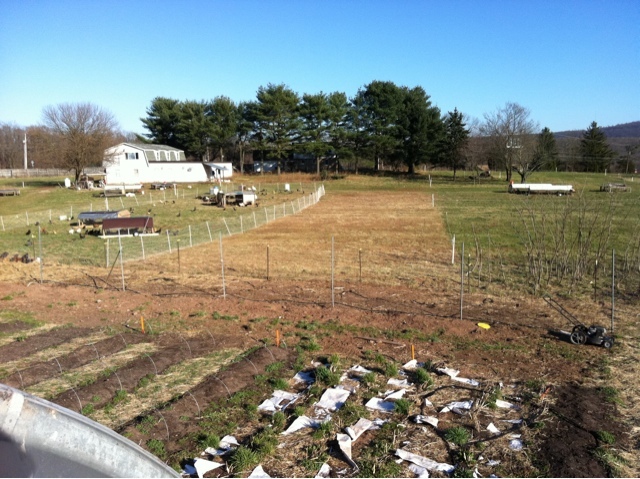 With the hoophouse even tomatoes can go in soon..
We have hundreds of laying hens. Beautiful birds, a wide variety of breeds..none of them are the new breed of production bird. Our girls are colorful and varied, as are their eggs. We are at the time of year when egg laying should commence again. Yesterday I found one egg, the day before three eggs. This output has been true for months now..while at the same time those hundreds of gals eat. Every day. Eating us out of house and home. We have been raising egg layers fir years. We let them live out their lives..commercial egg operations will take their hens to Campbell Soup after their first cycle of egg laying. 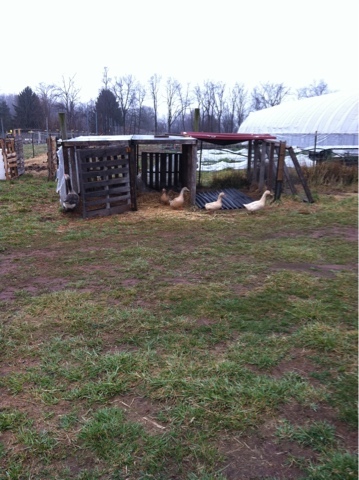 We keep ours..there are laying hens out there that are 5 years old. They don't lay eggs as frequently but when they do those eggs are huge. But there must come a time when eggs stop. And while we don't know exactly where that outer edge of productivity is located, we know that we need to stay in business and not feed hens that are not producing. 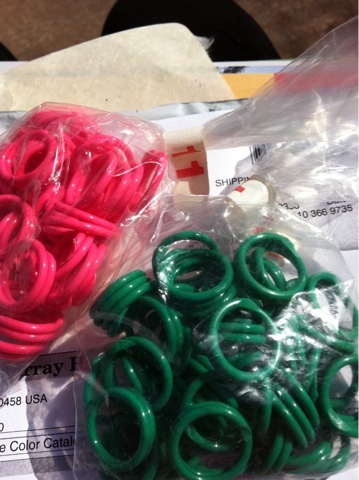 Homer purchased these pretty plastic rings. 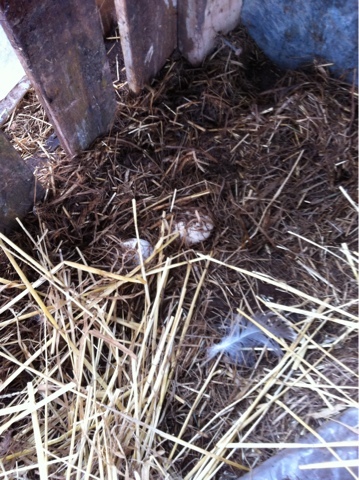 They fit over a chicken foot when the bird is small..and will mark which hens are likely to produce the most eggs. The old gals..might just end up as chicken soup..
An email arrived in my inbox the other day, asking if I'd like straight run of White Leghorns. For free. Turns out there is a program around here that teaches about eggs and hatching, and once hatched a home is needed. 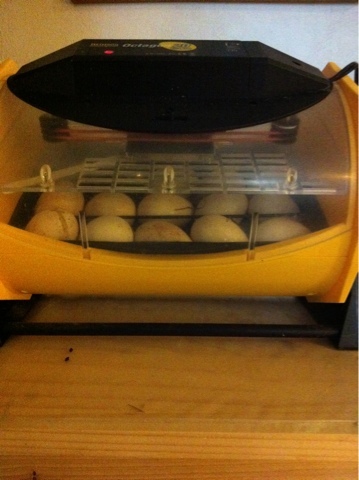 Our brooder is all set up, I just needed to plug in the light and put down feed. And set up water. The birds know how to do the rest. Yesterday it was quite warm and sunny. The brooder is in the hoophouse where the temperature can get too hot..over 120 degrees. For part of the day the door to the building was propped wide open and the heat light was off. 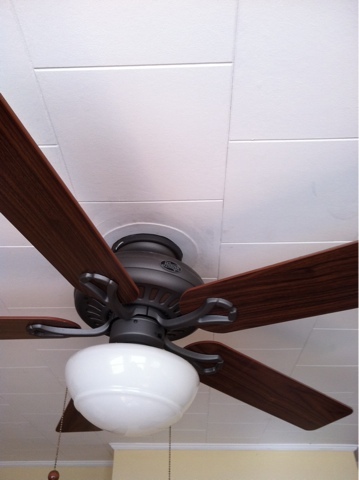 When the sky clouded it was necessary to get back and plug the light in, close the doors securely. All babies require constant monitoring of them and their conditions. We run a farm on a fulltime basis. Homer is really the one who runs the farm and manages where the cattle, pigs, chickens, turkeys, egg layers, vegetables all go..I help with that a bit, but he really does that. We are blessed to have amazing visitors who come here to learn, to help, to contemplate how this life might be possible for more people. Land is ridiculous expensive. 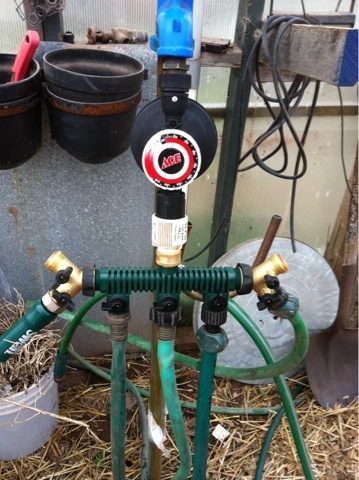 Just to install a well and septic system on raw land can cost $40,000. A house costs even more..usually a lot more. 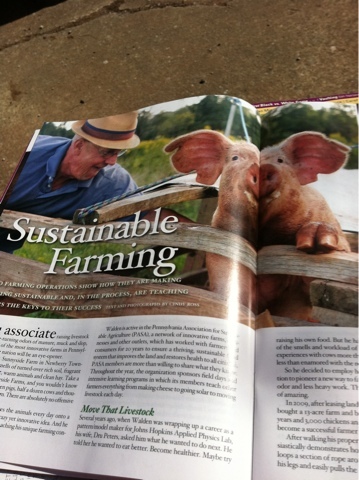 So how can farming be a career, fulltime, for the people we need to grow our food? In the NYTimes the other day, an article highlighted a farming family..a dairy..a man in his 80's, his sons in their 50's, a granddaughter in her 20's. Much concern was expressed about how a person in their 20's can make enough to live on, to support full time work. All that investment in infrastructure, all that capital equipment..and resulting lack of confidence in the business model in the future. Squeezed between the high price of utilities, feed, taxes, insurance, gas..will anyone pay a few dollars more for a gallon of milk to off set, to allow families to stay on farms? The true beauty of farming is running a business. Not being an employee and being an entrepreneur instead. In having ideas, living them out, learning from other folks doing similar or entirely different things. The real challenge is being saddled with debt. Debt crushes the soul, the spirit, the creativity. Debt begats fear. Debt makes people tense and unhappy. How can life be lived debt free? How can all of our monthly bills be reduced, to levels that allow time to..think, make music, cook, put food in season by so food bills are greatly reduced? How can weight be lost, muscle built without paying for a gym membership or a personal trainer? To us, these things all tie together. We look around at the area we live..where is land cheap? Who can live and work there? How can it be done mortgage free, and at a scale that produces good food? It sure seems like people are willing. We have visitors and people asking all the time. And then the price of land..kills that..and folks realize that an off farm job might be needed. Can we change that? How much land is really needed to produce bread, pancakes, cakes, pies for a family for a year? Homer has an idea. We spoke about it in Detroit. In a few hours I'll talk about it in York..to local high school students who have opted into hearing about careers in agriculture. In 30 minutes I'll offer them insight as to how to formulate a mission statement, a business plan, a marketing plan, how to start growing and stop the Monsanto's of the world cold. In the words of Albert Einstein "if at first an idea is not absurd then there is no hope for it". And Thomas Edison "opportunity was missed by many because it showed up in overalls and looked lime work". Our favorites..think big thoughts, do the work. Visit the White House, pick up pig slop. Today's pictures..Homer in Pennsylvania magazine, just publishing. 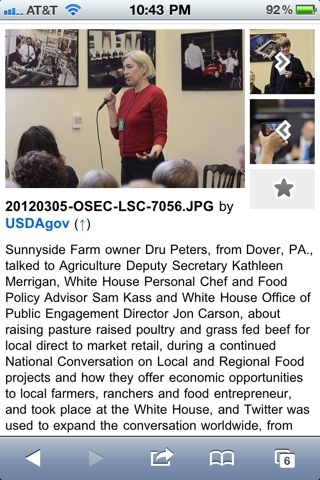 Dru on USDA website, includes link to session earlier this week. Yup, we can. And we are examining our larder and planning for this season..need more of everything. What takes some time in the summer..and we always can as a group, it is a happy time all working together..results in real fast food in the winter. We open a can of tomatoes, put into a pot with a frozen half chicken and go about our day. It cooks up beautifully, and with a fresh herb on top and a mess of collards on the side..it feels like super food. We are ready to take on the world..and dinner took the time to open the jar, dump, open freezer and bag, lay frozen chicken on top. At mealtime a little chopping and in about 15 minutes delicious meal! We will do lots more this summer. 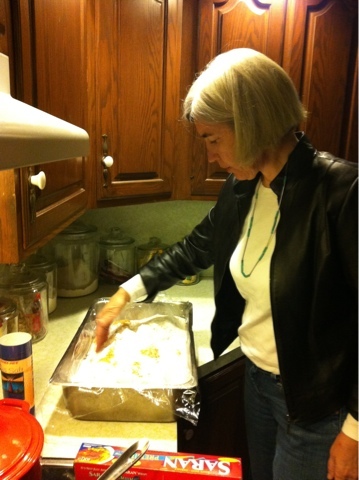 My favorite blog, Food In Jars, author has just published her first book. You will be able to find it on our shelves, as her pectin free, lower salt options appeal to our palates. 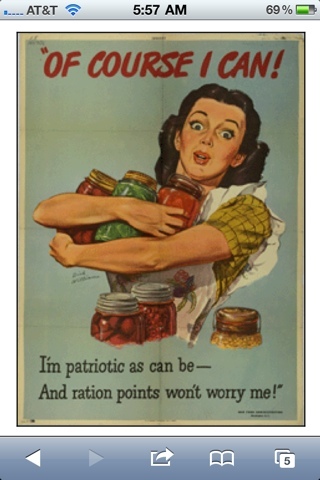 And her recipes for sauces, jams, etc. are truly delicious. Yesterday I traveled to Washington DC, right to Pennsylvania Avenue. Drove to the train, transferred to the subway and then walked a couple of blocks. As I approached the White House tons of Secret Service officers stopped all vehicle and foot traffic, as a motorcade approached. We all waited as many vehicles drove past, until finally several limousines with the flag of Israel drive past. Looks like the president might be busy with someone else today. Then round to the check point..after a slight delay into another security checkpoint and then into the meeting. Lots of friends there. I'm surprised by how many people I know who are part of the food network and are part of the expanding world of how food gets to people. Through twitter I met Orren Fox, a high school freshman who has started all kinds of farm clubs at his not traditionally an ag school. While waiting to get through security I met Michael Sorrell, president of Paul Quinn College, a school in Dallas. When he arrived there it was a food desert.no where close to get any fresh food..so the school tore up their football field and replaced it with a vegetable garden. 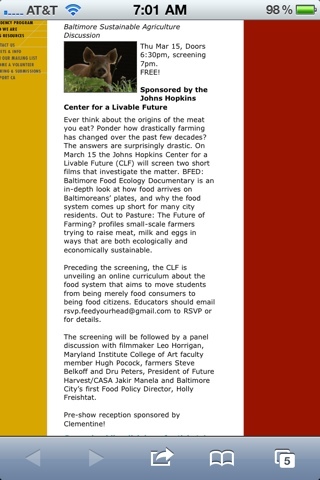 Holly Freishtat, Baltimore City food czar was there. Dena Leibman from SARE and Stephanie Ritchie, the USDA librarian for alternative farming. I met the president of FFA and a number of other folks who work for the USDA. The time there was to bring focus to the USDA Know Your Farmer Know Your Food website. This website uses an interactive map to highlight all the work that the USDA is doing to support farmers who grow food that is eaten..the funding of hoophouses, of food hubs (to help aggregate food from farmers into packaging that groceries and food service systems can handle), the funding of card readers at farmers markets so SNAP cards can be used there, the funding of small, portable meat processing plants (including recognition that many small facilities will help with food safety issues)..after Kathleen Merrigan reviewed each of the areas the USDA is working and pushing to help food get grown and stay local I had no questions for her. And then Sam Kass had joined in the conversation, speaking with love and reverence for..vegetables..grown in the White House garden, and used in meal preparation for the first family. He also spoke of keeping honeybees, and just how easy both of these things are to have anywhere. 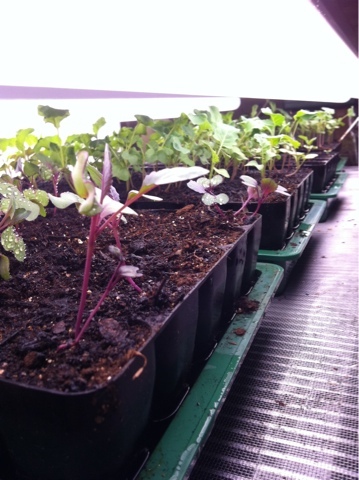 I had the chance to speak with Colleen Rossier, who does research on the science of farming. Our farm philosophy, dedicated to the idea that others can replicate what we do here, employ a couple of people, support a number of other farms, use little to no fossil fuel and still produce quite a bit of food did not seem at all odd to the assembled crowd. It was interesting and enlightening. I was happy to participate, to tweet my thoughts and impressions..and then get back to picking up vegetable pulp from local juice bars to feed to the pigs. Such is the farmers life. When Undersecretary Merrigan asked me about meat and processing where we are..I just had to tell her I had driven 2 pigs to the butcher on my way to DC that morning..
Today, after chores are completed, I transport 2 pigs to the butcher. They are already loaded into the truck. Then I'll drive to Baltimore, take the train to DC, the subway to Farragut West..and then walk to the White House. 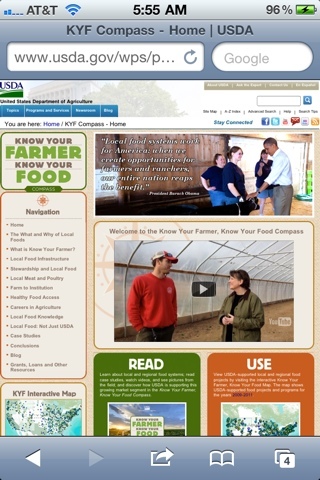 Today is the launch of the USDA Compass of their Know Your Farmer, Know Your Food. I was invited to participate in today's session..including the possibility of saying a few words as to why we farm the way we do. 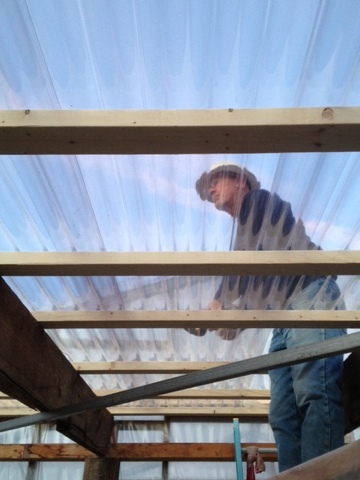 Then it is back to pick up pig slop from those that save it for us, pick up an intern for a visit to another farm, and several reminders to close the lid on the cold frame in the hoophouse. It just won't do to lose our young plants over all this! We need them growing so our CSA boxes are full come May! Balance. 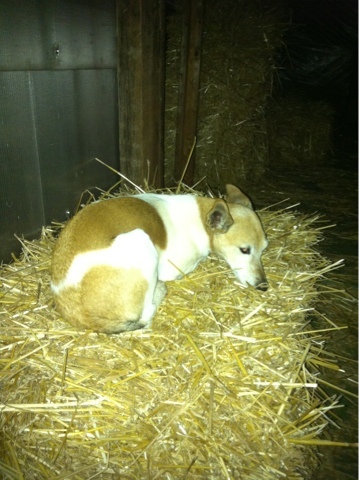 Without our friend Jessica none of this would be possible, as she will make certain that all is well today on the farm. There is a twitter feed..photos, comments and all..#KYF2, I'll be on it this afternoon if you would like to follow along. The larder is almost empty. Few jars of tomato, peach and pickles remain, strawberry jam is all gone. There are still blueberries in the freezer, but the apples have gone mushy (and I got stung by a yellow jacket when I went through the apples). One winter squash left, barely any chicken. 3 eggs yesterday from 400 hens. 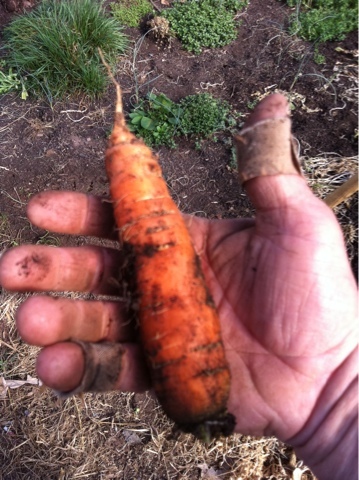 Then there are signs of hope..a beautiful carrot located and consumed. 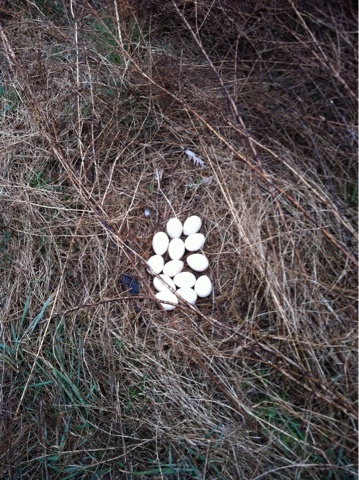 The geese make their massive nest and the first if their massive eggs. When the ducks line up to check into the goose nest the line is short one duck, and we know there is a nest somewhere on the farm with a momma on top. So while there might not be much food left that we stored last year there is promise of much to be here, and soon. 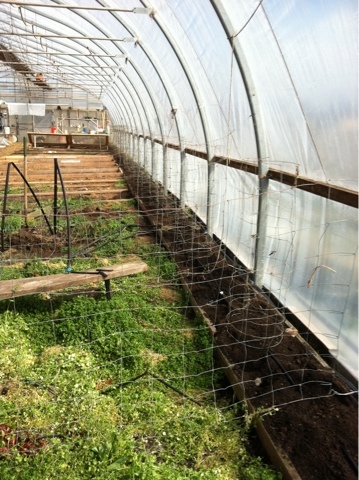 600 peas went into the far side of the hoophouse yesterday..snow peas and English peas in equal amounts..for 40 CSA members..and 200 are already 3-4 inches high..broccoli, cauliflower and cabbage seedlings look great, more go in this week. The fruit trees are not flowering yet, but buds are swollen and ready to pop. We will make it, no question. Borage is an herb that originated in the middle east. 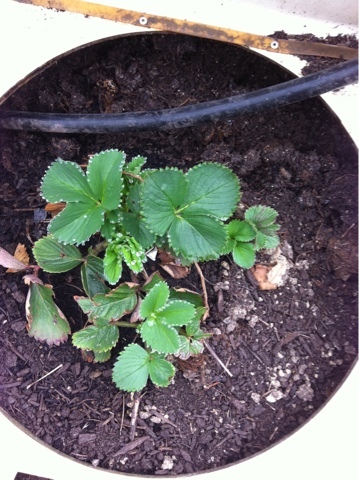 It produces leaves and flowers that are both edible. Used as a companion to tomatoes, it is reported to confuse the moth, hawkmoth or Manduca, that lays eggs those tomato hornworms. 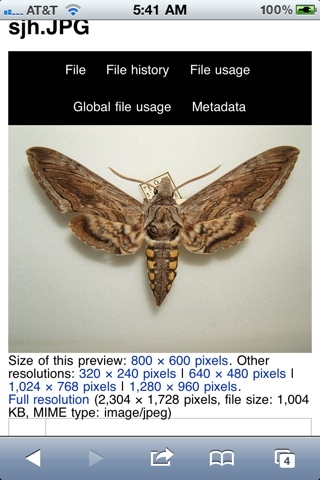 The moth lays it's eggs in the wrong place and destruction of the tomato plant is greatly reduced. We have a jump on the season here with these. 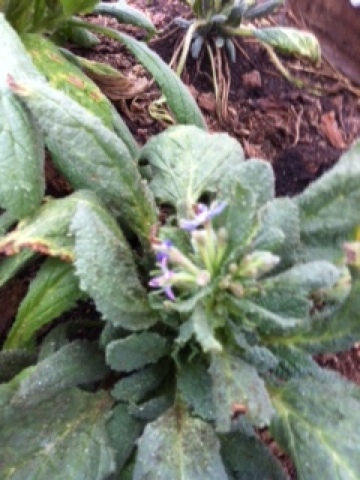 Furry leaves, blue flowers, we will be keeping these around as our tomatoes go in the ground. 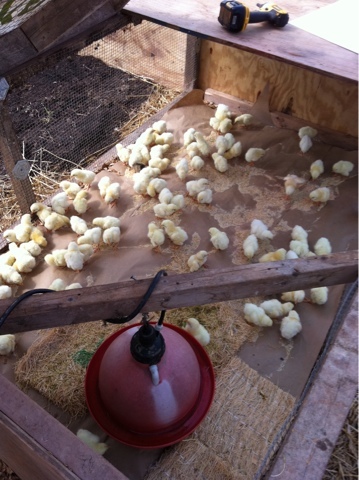 First batch of peepers arrives at the end of this month, so the brooder needs to be ready. 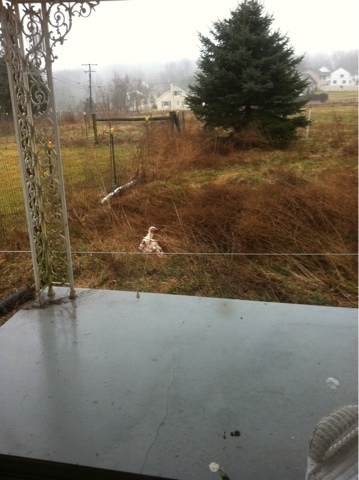 The young birds must stay dry, warm, and well protected from..all that love to eat tiny chickens. One brooder went in yesterday. 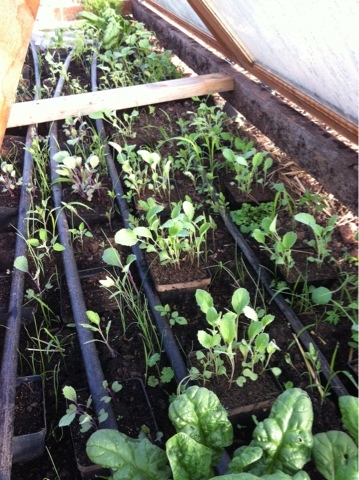 Vegetables are starting everywhere, so new beds are needed each week. 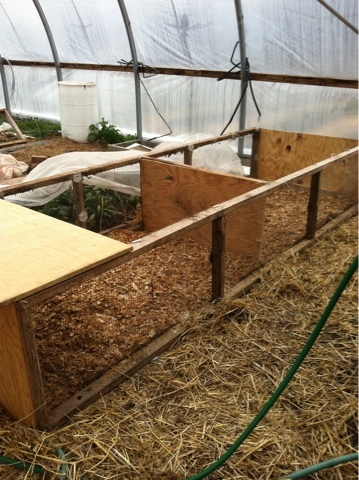 Homer has dismantled old pens and put them to use as framework for the beds..getting things set up for dropping seeds.